The former Spartan is finding a home with in San Antonio. 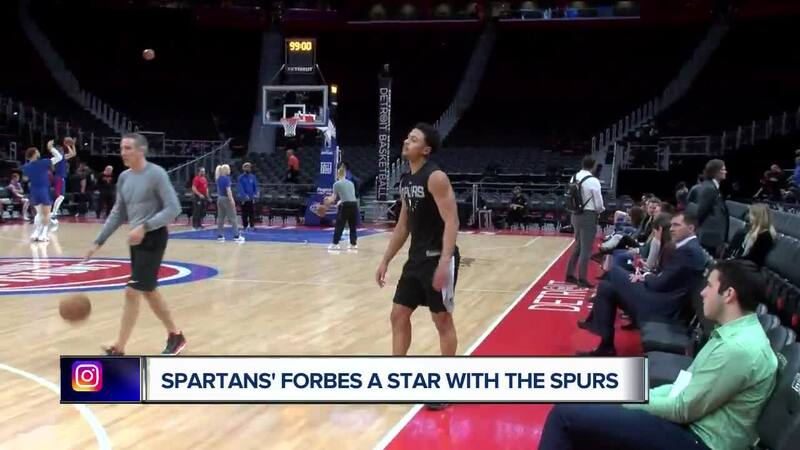 DETROIT (WXYZ) — Lansing native Bryn Forbes is back in Detroit. While it's only a short stay, as the San Antonio Spurs make their only trip to take on the Pistons, Forbes is feeling right at home with friends and family expected to be in attendance. Forbes is a rising star in the NBA. He went undrafted in the 2016 NBA draft, but the Spurs saw something in his shot, and now he's making the most of his opportunity. Action Sports reporter Justin Rose caught up with the former Spartan before he took the floor against the Pistons to discus his recent rise in play, his life off the court, and his continued relationship wioth his former head coach Tom Izzo.